Dias: “We've done our bit. Now it's their turn." 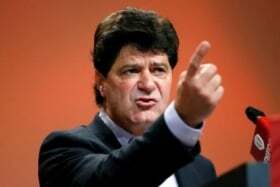 Unifor President Jerry Dias is calling on Canada's federal, provincial and municipal governments to support the auto industry now that his union successfully won Detroit 3 commitments of nearly $1.6 billion to invest in Ontario operations. "We’ve done our bit. Now it’s their turn," Dias wrote for the Huffington Post, for which he is a contributor. $554 million by General Motors. $331 million from Fiat Chrysler Automobiles, including a new paint shop in Brampton, Ont. $713 million by Ford Motor Co., which will spend $613 of that on a new engine program in Windsor, Ont. "Now it's time for all three levels of government to do their part," Dias wrote. "Canada still has inadequate programs from our governments to attract and retain the auto industry in this country." Dias wasn't specific about what he wants the government to do. Calls to Unifor for clarification weren’t immediately returned. "He’s not specifying what he wants, but I think I know what he wants, and that’s a handout. I think that is a very dangerous road to go down," head of the Canadian Taxpayers Association Aaron Wudrick told Automotive News Canada. "The government can provide a better business environment by cutting taxes and making it easier for these entities to do business. In Ontario, they can start by lowering energy prices for these businesses. "If he’s looking for a direct handout from taxpayers, there’s no reason why millions of Canadians elsewhere should have to subsidize corporate entities like GM, Chrysler or Ford." Unifor claims one direct automotive job creates up to six or seven other "spinoff jobs." In his piece, Dias was critical of the previous Conservative government, led by Stephen Harper, which offered repayable loans through the Automotive Innovation Fund. The fund offers a $250-million annual pool for auto companies. The program expires this year. During the 2015 election campaign, the Conservatives promised to increase that fund to $1 billion over 10 years, but they didn't get reelected. The previous government assisted Ford in its $700-million upgrade of its Oakville plant about four years ago. During this year’s auto talks between Unifor and General Motors, Navdeep Bains said his more labour-friendly Liberal government is looking at new ways to assist the auto sector. "We're currently working closely with the automakers to make sure that we look at means to bring investment," he said in September. "We have many tools in our toolbox and the idea is for us to engage with them to increase investment."